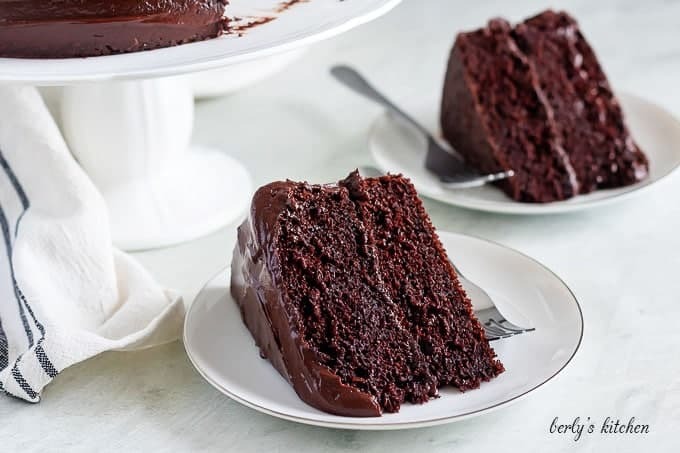 If you’re searching for the best chocolate cake recipe, then look no further. Our’s is rich, moist, and loaded with smooth chocolate ganache! This post is an older one. It was originally published back in May of 2016. Kim and I were looking over it a few days ago and decided it needed a re-write. Nothing too crazy, just an update and add some process shots. Kim did modify the recipe slightly by removing the espresso powder and substituting vegetable oil for coconut oil. 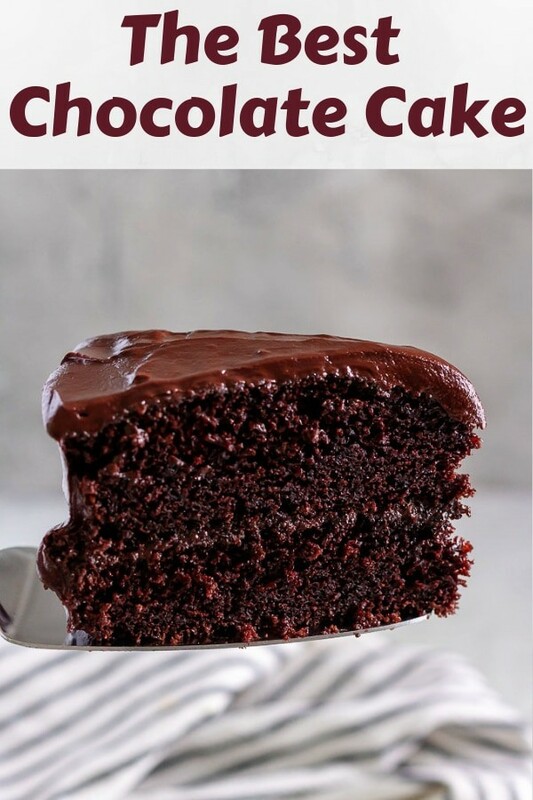 Honestly, it doesn’t change the formula much and this chocolate cake remains one of my favorites. We called it the best chocolate cake recipe back in 2016 and feel it still holds that title. 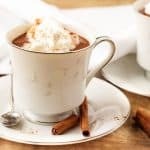 As the descriptions reads, it’s moist, decadent, and definitely satisfies your cravings for chocolate. But, you’ll have to decide for yourself, whether or not it’s the best. So, let’s get started! As with most of our recipes, I recommend gathering up all the needed ingredients and prepping as much as you can. Also, go ahead preheat your oven to 350 degrees F. and prep two (2) nine (9) inch cake pans with butter and flour. It might be a good idea to let the coffee cool off a little before using it. Otherwise, it may cause the eggs in the recipe to scramble. 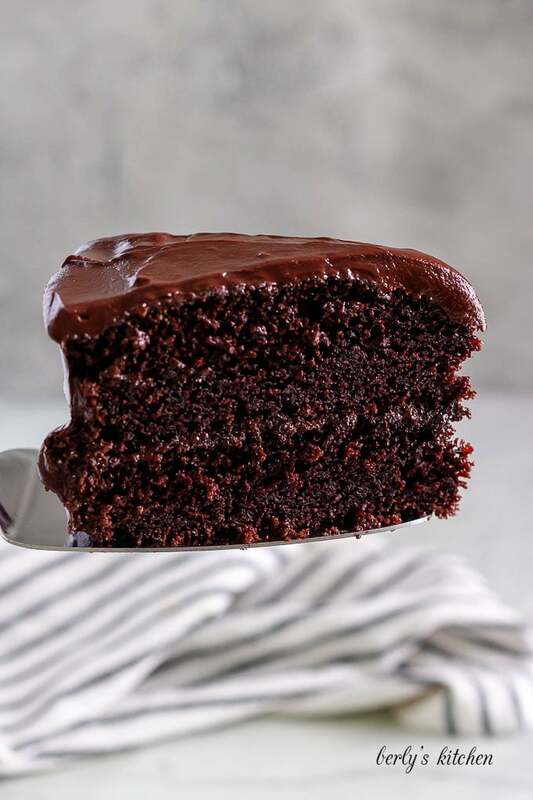 Just a quick side note, this chocolate cake recipe was adapted from a the Hershey’s Kitchen. You can get that recipe by clicking this link. 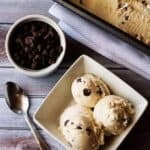 Now, grab a large glass mixing bowl and begin sifting together the sugar, all-purpose flour, cocoa powder, baking powder, baking soda, and salt. Once sifted, use a whisk to give them a quick stir. After that, use a mixer or whisk to combine the dry ingredients with the milk, oil, eggs, vanilla extract, and the brewed coffee. You can probably plan on mixing for about sixty (60) to ninety (90) seconds. The batter will be thin, so don’t panic. At this point, it’s time to split the chocolate cake batter between the two (2) cake pans. Try to split it up as evenly as possible or your layers won’t be the same thickness. Then place the pans into your preheated oven and let them bake for about thirty-five (35) to forty (40) minutes. As always, use the, “toothpick method,” to see if the cakes are done. Remove them from the oven and and put the chocolate cake layers on a cooling rack to cool for a bit (twenty (20) to thirty (30) minutes). This part is really simple and only takes two (2) ingredients and two (2) steps. In a small saucepan, heat the heavy cream over low heat until it starts to steam. Afterward, in a medium sized mixing bowl, combine chocolate chips and heavy cream. Use a spoon or whisk to carefully stir the mixture. A thick, creamy chocolate ganache will form in the bowl. All that’s left to do is assembly. Take one of the cake layers and put it on a cake stand or serving platter. Then start pouring the ganache over the first layer. That’s for your sweet filling in the center. Kim recommends using about a third (1/3) to a half (1/2) of the ganache. Place the second layer on top, then add the rest of the ganache. Use an icing knife or even a butter knife to smooth it out, or simply pour it on thick and let it drip. 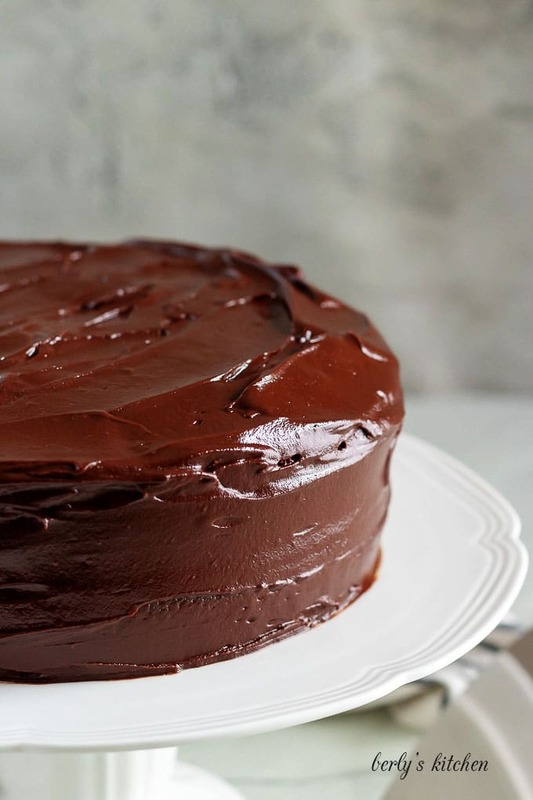 This best chocolate cake can look anyway you want it to. You’re all done now, slice and enjoy! Okay, baking isn’t really my strong suit. So I did a little research to bring you these tips. I hope they help! To keep your cake from drying out, consider, “sealing,” it with a simple syrup (sugar dissolved in warm water). Do this before adding any frostings or ganaches. 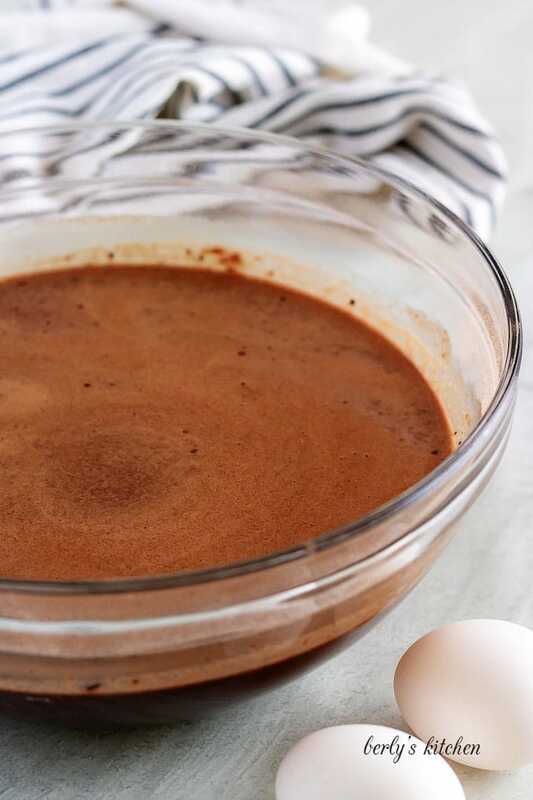 One way to keep hot liquids from scrambling your eggs is to combine the hot liquid with a cold one before adding it to the recipe. For example, mix together the coffee and milk before putting them into the batter with the raw eggs. Not a fan of chocolate ganache? That’s okay, use a store bought frosting or make your own using cream cheese, butter, sugar, and any other flavoring agents (like orange juice or orange extract). Doing so will create your own unique topping for our best chocolate cake. Check out some of our other popular baked treats! 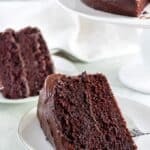 If you're searching for the best chocolate cake recipe, then look no further. Our's is rich, moist, and loaded with smooth chocolate ganache! Preheat oven to 350 degrees F. and grease two 9-inch, round cake pans with butter and flour or cooking spray. 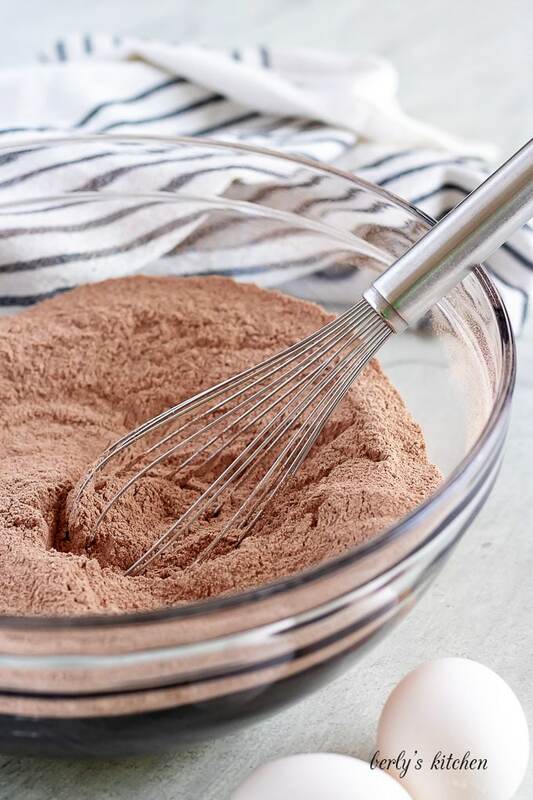 In a large bowl, sift together the sugar, flour, cocoa powder, baking powder, baking soda, and salt. Set aside. Using a hand mixer or a stand mixer, combine the dry ingredients to the eggs, milk, oil, vanilla, and coffee. The batter will be thinner than most cake batters. Carefully pour the batter into the pans. Place the pans into the preheated oven and bake for thirty-five (35) to forty (40) minutes. The cakes are finished when toothpicks inserted in the center come out clean. Remove the cakes from the oven and allow them to cool for five (5) to ten (10) minutes before removing from the pans and transferring to a cooling rack. Steep the heavy cream in a small saucepan over low heat until small bubbles form around the edge and it begins to steam. Don't let it boil. Place the chocolate chips into a small bowl and pour the hot heavy cream over the chocolate chips. Stir until smooth and creamy. Place one of the cakes onto a flat surface, preferably the one that will be used for serving. Pour approximately one-third (1/3) to half (1/2) of the ganache onto the layer and allow some to flow over the edges. Add the second layer and repeat the process. Use as much or as little ganache as you'd like. The calories listed are an approximation based on the ingredients and a serving size of 1/12th the whole cake (one (1) piece when the cake has been cut into twelve (12) equal sized slices). The chocolate cake can be stored in your fridge, in a sealed container for up to five (5) days. the chocolate cake don’t show how many eggs in the recipe?